For the first time ever, a new class of U.S. Navy carriers will set off with no urinals on board, reports the Navy Times. Urinals are omitted from the Gerald R. Ford class of carriers, due to hit the fleet in 2015, as both a cost-saving measure and an attempt to make bathrooms more gender-neutral. Urinal-free ships allow the Navy to easily switch a bathroom's designation between male and female, helping the ship adapt to changing crews. The U.S. Navy has deployed women on ships since 1994, but every carrier built since then has included urinals. In addition, urinals clog more than toilets and can cost more to maintain, Capt. Chris Meyer, manager of the Future Aircraft Carriers Program for the Naval Sea Systems Command, told CNN. Several sailors speaking on the condition of anonymity told the Navy Times that urinals were hard to clean and easily broken, and they were glad to see them go. 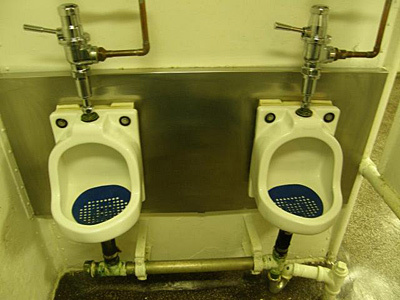 "There's a lot more at play in the design objectives than (making the toilet areas) gender-neutral," Meyer told CNN. "We're saving money in maintenance costs, and we’re improving quality of life." Other quality-of-life updates to the carrier's design include sleeping quarters — known as berthing areas — directly connected to a toilet and shower, so sailors who wake in the middle of the night won't have to get dressed and cross a passageway to reach the nearest restroom.